In the high mountains above Loch Leven there lurks an enchanting stretch of water called Loch Eilde Mor. Translating from the Gaelic as 'big loch of the hind', the watery finger tickles the rocky underbelly of the Mamores, one of Scotland's most spectacular areas of mountain scenery. 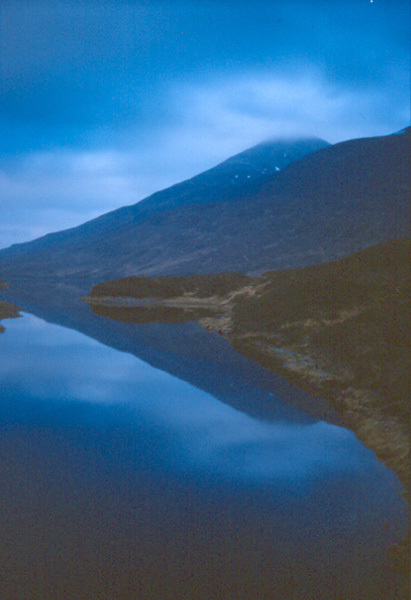 The loch is easily reached from Kinlochleven. The first section of the route climbs with the West Highland Way on to open moorland, the effort of ascent amply rewarded with views over Loch Leven to the Pap of Glencoe. Then a track skirts round the hillside, climbing to a tiny boatshed by the water's edge. On a calm, windless day, there is little to ruffle the cool surface of the loch. Savour the tranquility and if you tread carefully you may spot the red deer from which it takes its name. Leave the car park through the main entrance on to the road, turn right and follow Wades Road west, past St Paul's Church, a white building on the right just beyond the car park. Continue straight along the road until it joins the B863 close to a bridge over the Allt Coire na Ba. Turn right, cross the bridge and follow the road out of town towards the school. There is a West Highland Way marker a few yards beyond the bridge. Opposite the school, the West Highland Way branches off to the right at an information board, waymarker and green footpath sign for Fort William. Leave the road here and follow the path as it rises through woodland, crossing a couple of minor streams. Another WHW marker is soon reached. Follow this left and the path emerges a short way on at a single track road. Cross the road and continue up the path. The path emerges from the woodland on to open moorland and soon joins a track at another waymarker. Turn right here, leaving the West Highland Way, and head east. The track runs fairly level round the hillside, offering good views over the surrounding countryside. It passes a tall aerial mast before descending to Mamore Lodge, passing a wooden chalet and a couple of green buildings before the lodge is reached. The track arrives at a T-junction behind the lodge. Carry straight on and the route rises to a house a short way on. A signed footpath bypasses the grounds of the property, rejoining the track on the other side. From there, continue along the track as it curves north to follow the Allt Coire na Ba up the glen, dramatic craggy peaks looming overhead. The track crosses the burn by a wooden bridge and on the far side there is a junction. Bear right here and the way heads south east, curving round the lower slopes of Na Gruagaichean. 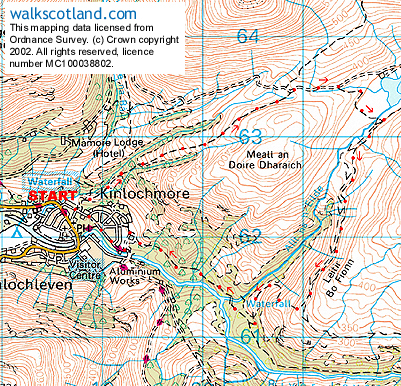 Stay with the main track and continue up to Loch Eilde Mor. At the highest point of the track, a path branches off to the right at a cairn. Don't take this. Instead, continue on for 500 yards or so as the track drops down towards the loch and another path on the right is reached. 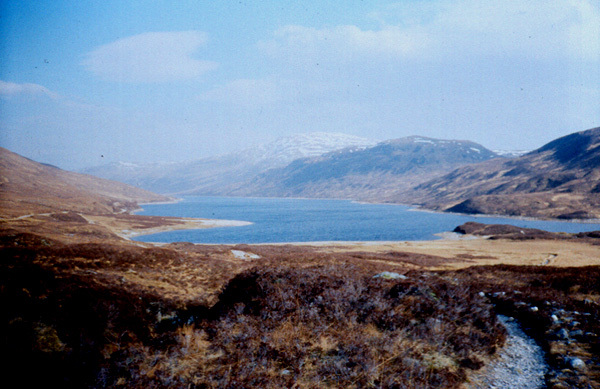 Follow this round the head of the loch to a dam over the Allt na h-Eilde. Cross the dam and turn right. A grassy path, wet in places, runs south above a pipeline part concealed by the ground. Continue along the path, passing two metal huts both to the left of the way. About 100 yards beyond the second hut, where the pipeline begins to curve east, the path reaches a cairn marking the start of the descent towards the River Leven. Turn right at the cairn and a fairly steep path of grass and rock drops down the hillside, curving right and left as it loses height quickly. Take care as the rocks can be slippery. As it nears the base of the glen, the path enters woodland to emerge at a gap in a stone wall next to a small stream. A path rises from the wall to meet another path. Turn right and follow this down to a wooden footbridge over the Allt na h-Eilde. From here, the path runs through the trees back into Kinlochmore. Just before the village, it forks. Take the left arm and it joins the end of Wades Road close to the former aluminium smelter. Follow the road back to the car park. Grading Path and track throughout with a fairly steep climb through woodland early. Suitable for fit walkers and older children. Dogs need to go on the lead in places due to sheep grazing.